Below is a list of frequently asked questions. You may want to review these questions and answers before contacting the Police Department. What are the fees associated with the release of vehicle? Depending on what code section the vehicle was towed for will determine the fees. Please contact us with your questions or see our stored vehicle page for more information. How many residents reside in the city of Broadmoor? As of the last census there were 4,026 people, 1,275 households, and 984 families residing in Broadmoor. There is a junky non-running car in my neighbor’s yard can the Police get it removed? Yes SMC San Mateo County municipal code, prohibits the storage of non running vehicles in the front/side or rear of a residence within the county. A violating vehicle may be removed at the owner’s expense. How long does a car have to be in front of your house before the Police can legally remove it? If it’s parked blocking a driveway the Police can have it removed immediately. If it’s parked legally in the street, it can be there no longer than 72 Hrs. (3 days) after the Police have marked the Vehicle. I think my son maybe in a gang, what can I do? Note the colors of clothes he or she wares like all blue or all red, look for letters and or numbers that may appear on backpacks, books and other personal items. Ask them about it, if you feel they are and are not being truthfully. Note the markings and contact the Police. Can I get a tour of the Police Department? Residents are encouraged to visit our department. Please contact us and a member of our staff can setup a day and time for you to come down and see our department and meet some of the officers. 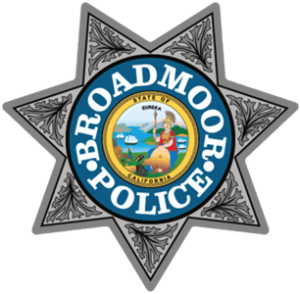 Does the Broadmoor Police Department have Citizens Police Academy like I see in other Cites? 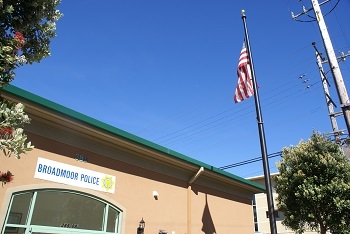 Currently the Broad moor Police department does not have a Citizens Police Program, but with enough interest it may be possible in the future. What times are the Front Office staffed? Monday through Friday from 8am to 4 pm. Why do the Police cars have cameras? Basically for safety, cameras are a excellent way to document just what is happening that has the Officer’s attention for future reference.